If you are looking for a new television for your home or office in the price range of Rs. 10000 to 12000 then you are at the right place. In this article, we take a look at the best TVs under 10000 available in India as of 2019. Best LED TVs from top brands like Samsung, VU, LG, Panasonic, Cloudwalker, MarQ have been covered in this article. Most of the LED TVs on this list have HD ready resolution and some of them come will a Full HD display. The TVs priced below 10000 have a screen size of 32 inches and some of the options have 24-inch screen size and are priced around Rs. 8000. All these televisions have great displays and audio output. You will see dual speakers on most of them which are loud enough for everyday use. If you want, you can always connect external speakers. Both normal and smart tvs are covered on this list. If you are looking for more options in Smart LED TV category then take a look at best Smart LED TVs under 20k-25k. Below you will see a brief review of each LED TV with its pros cons, specs, features. Prices and buy links to Amazon and Flipkart are also provided. Online prices are dynamic so to check the latest price please use the links provided. Let's take a look at the best LED TVs under 10000 in India. This is a basic entry-level LED TV from Thomson. Priced under Rs. 10000, it offers incredible value for money. The display size is 32 inches and the resolution is HD ready which is what we usually see in this range. The TV comes with a Zero Dot A+ Grade Panel which means you get vivid colors and great viewing angles. The brightness levels are really good as well. To give you a surround sound experience, Thomson has provided dual speakers which deliver 20W audio output. The audio is loud and clear and the bass levels are decent as well. To let you connect multiple devices like a set-top box, pendrive, laptop etc to your TV, it comes with 2 HDMI and 2 USB connectivity ports. The TV supports MPEG files, which helps you play a wide variety of video formats without compromising on the picture quality. It is not a Smart TV so you cannot connect it to WIFI. You can always turn it into a Smart TV with an Amazon FireStick. Gorgeous display and incredible sound make it one of the best 32 inch led tv under 10000 in India. iFFALCON is a new brand in India in LED TV and offers good specifications and features at a very good price point. This is a 32-inch smart LED TV with A+ grade HD display resolution. The picture quality and crispness are decent for the price range. The design somewhat has little thick bezels on all the 4 sides on the TV. The brightness and colour contrast of the television is adapted automatically based on the type of content and scene which is known as micro dimming and gives you a next level experience. This is a smart LED TV and comes with inbuilt WiFi that allows you to watch entertainment content on apps like YouTube, Netflix, YuppTV on the big screen. You also get the smart sound where it automatically adjusts the volume based on the type of program you are watching. Also with the Dolby audio speakers and built-in stereo box speaker, you will never complain of the amazing sound experience. This iFFALCON television comes with its own app store that has support for various video, music, gaming and social media apps. The TV supports the YouTube, Netflix, YuppTV application among other entertainment applications. Also, the remote comes with a dedicated Netflix hotkey to quickly launch in just one button click. As in all television models that support WiFi, also support feature to cast the mobile screen which can be done on this TV as well. For external connectivity, this 32-inch smart led tv offers 3 HDMI and 2 USB ports which are plenty for each user. Overall for a price of under 10000, it is a good option to consider and performs decently well in all the departments and is a feature rich TV. If you do not have any budget constraint, then you can select the LG or Samsung model but similar specification models cost around 20k. 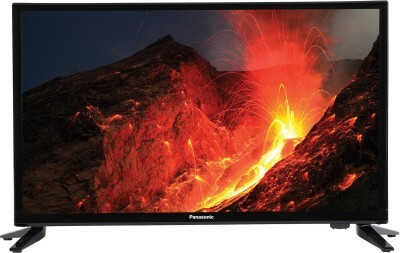 This 24 inch LED TV from Panasonic is a great performer and is highly rated on Flipkart and Amazon. The display is sharp and bright with good viewing angles. The refresh rate is 100 which is really good and gives a smooth watching experience. The display resolution is HD which looks great. The audio output is decent but not the best. 1 HDMI and 1 USB port are available for external connections to the TV. This Panasonic LED TV has a true surround sound system with two speakers that produce decent speaker output. If you are looking for a led tv under 10000, we think this TV offers excellent value for money with Panasonic brand quality and durability. Go for it. Noble Skiodo might not be a well-known brand in India but this LED TV is impressive. At around Rs. 10000, you get a good 32-inch display panel of A+ grade. The display is sharp and bright with good contrast. The audio is decent as well because of the inbuilt dual speakers which deliver a sound output of around 20W. 1 USB port is provided to connect external hardware like pendrives and 1 HDMI port is provided to connect the TV with your laptop or other HDMI compatible devices. There are in-built games available in this LED so if you have kids, they will love it. One interesting feature in this LED is that it shuts off automatically when you are not watching it. Overall, it is a good led tv and offers high value for money. Go for it if you are not brand conscious and need a LED TV in a budget of around 10K. LG is one of the top brands in India in the consumer electronics category. They are known for making high-quality products plus their after sales service network is excellent. This 24 inches LED TV from LG comes with a beautiful and vivid display with accurate colours, good brightness and excellent viewing angles. The refresh rate is high which makes the viewing experience even better. There are dual speakers which deliver good sound output which is loud and clear. There are 2 ports available on this LED, 1 USB and 1 HDMI to connect external devices like pen drive, laptop or Chromecast/Firestick to turn it into a Smart LED TV. Overall, the performance of this LED is excellent. Go for it if you are looking for a 24 inch LG LED TV under 12000. This LED TV is from MarQ which is Flipkart's brand for consumer electronics. MarQ products have decent quality and have low prices. The high value for money they offer is the reason we have listed them here. This LED TV from MarQ comes with a screen size of 32 inches and HD ready resolution. The display is bright, sharp and has good viewing angles. The audio output is 16W which is decent. There are 2 HDMI and 2 USB ports available which should be more than enough. It is priced just under Rs. 1000 by Flipkart which is really good pricing as LED TVs from big brands like LG, Samsung will cost you 7000-8000 more. Samsung is one of the best brands in India for a long long time. People trust Samsung because of their great quality products and excellent after-sales service. This LED TV from Samsung is priced just under Rs. 12000 and comes with a display size of 24 inches. The display is sharp, bright and has high contrast. The audio is loud and clear because of the dual speakers inside which deliver 10W sound output. There are 2 HDMI ports and 1 USB ports to connect external media to your television. It comes with the standard 1-year warranty. Samsung has extensive after sales support across India so if something goes wrong with the TV, you won't face any issues with the service. Overall, this led television works great and you won't have any complaints. It is one of the best seller LED TV under 10000 to 12000 price range. As of writing, this tv is rated 4.2 stars out of 5 by more than 7000 users on Flipkart. So that was our list of best TVs under 10000 in India. We hope it was helpful and you were able to find a suitable LED TV for your home or office. If you are looking for a 32 inch LED TV only then take a look at our list of best 32 inch LED TVs in India.